WHAT was supposed to be a hardcourt battle turned into a legal fight that played out at midcourt after officials of the Cebu Schools Athletic Foundation Inc. (Cesafi) tried to defy a Temporary Restraining Order (TRO) ordering them to allow the University of San Carlos’ Scott Aying to play on Wednesday at the Cebu Coliseum. A civil case was filed by the 15-year-old’s parents, former PBA player Danny and spouse Avah Michelle, against the Cesafi for disallowing Aying from playing this season, on the grounds that he had is governed by rules on transferees that require a two-year residency. However, the Ayings, in their complaint, claimed the league officials wrongfully interpreted the tournament’s rules and "unjustly disqualified" their son. Named respondents in the case that landed at the Regional Trial Court 7 were Cesafi president Fr. Manny Uy, commissioner Felix Tiukinhoy, basketball commissioner Danny Duran and screening committee member Jess Himotas. Aying, his parents and their lawyer, Donato Gonzales, arrived at the game venue together with court server Fritz Mejias to serve the TRO. However, Tiukinhoy and league counsels Baldomero Estenzo and Marvin Panares refused to accept the TRO and called it “defective”, resulting in a long-drawn legal discourse right at centercourt that lasted more than two hours. With an impasse looming, Tiukinhoy decided to postpone the match pitting USC against the Cebu Eastern College, as well as the other juniors match between the Sacred Heart School-Ateneo de Cebu and the University of the Visayas, to Friday. Tiukinhoy took note of an irregularity in the TRO, specifically the issuance date which showed the “16th of September” instead of the 18th. Moreover, Estenzo argued Aying remained ineligible under a status quo as he said that player was ineligible to begin with. Cesafi officials are expected to head over to the RTC on Thursday to clarify matters. An emergency board meeting has also been scheduled in the evening to discuss this particular case. 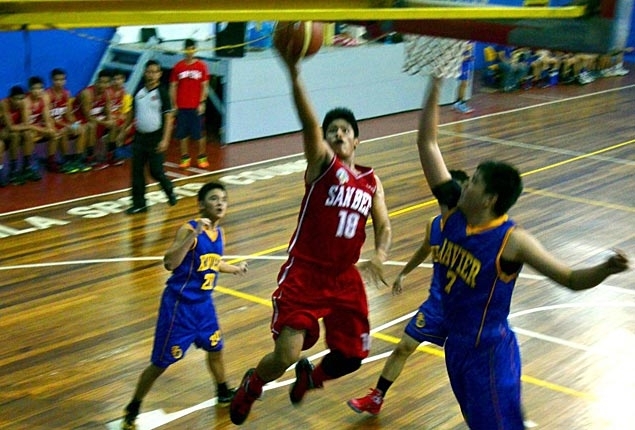 The controversy started when Aying was declared ineligible by the league’s screening committee composed of Tiukinhoy, Duran and Himotas, on August 2 citing a league rule that states, “Any high school student athlete of a Cesafi member school who transfers to another member school shall be required a minimum of a two-year residence to be able to qualify to play." Aying played for Don Bosco in 2011 but transferred a year later to San Beda. However, the original rules and regulations for the 2012-2013 tournament clearly made a distinction between high school and college players, such that the two-year residency rule for a student athlete of a Cesafi member school who transfers and enrolls to a non-member school for one year and comes back to enroll again in a Cesafi member school applies only to college athletes. This marks the second time that Tiukinhoy has been the subject of a civil case of this nature. According to the official, he faced one back in 1999 when he barred a player from the Salazar Institute of Technology (SIT) on the basis of his ineligibility. That case eventually led the dissolution of the CAAA and the creation of the Cesafi in 2000.